On purpose to sing to me." Citizen science, or public participation in scientific research, is a rapidly growing discipline in both scale and contributions to scientific research. If you have ever participated in a BioBlitz or posted to eBird, you are a citizen scientist that has likely contributed to ecological research! We have partnered with Mass Audubon, a statewide conservation organization that hosts many citizen science programs, to investigate the quality and scientific value of their volunteer-collected data. In particular, I am investigating a nest box monitoring data set from Broadmoor Wildlife Sanctuary, a Mass Audubon property in South Natick, MA. Volunteers at Broadmoor have monitored the timing and success of breeding in cavity nesting birds in 55 nest boxes for 30-years. Box occupants include tree swallows, bluebirds, house wrens, and occasionally black capped chickadees. We are interested in determining the relationship between the volunteer observations of nest development and climate change. The length of this 30-year (!!!) monitoring program will give us much more insight into the relationship between climate change and reproductive timing and success of these species than a shorter study would. We also get to work with enthusiastic and knowledgeable volunteers, making this project a win-win. Henry David Thoreau in his letters, 1843. Dr. Amanda Gallinat received her PhD degree at the official BU hooding ceremony. 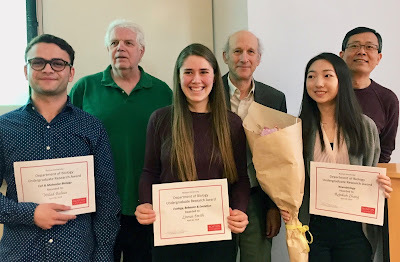 Sarah Pardo presented the results of her senior research on leaf longevity at the Boston University Academy research symposium. Linnea Smith was one of three undergrads selected to present the results of her undergraduate honors research to the BU Biology Department. An interview with Linnea was also featured in the publicity of BU Giving Day. 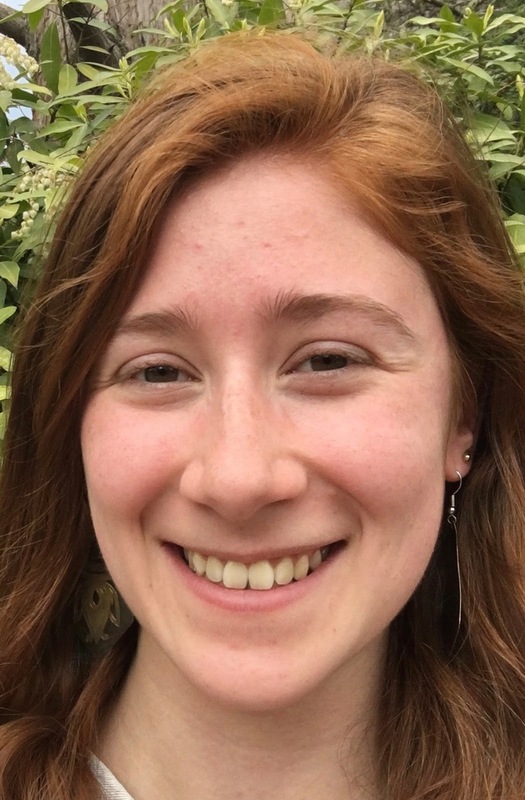 Elena Newmark, a graduating senior, was awarded BU’s Francis Bacon Science Writing Prize for her paper on the effects of noise pollution on marine invertebrates written for BI 448 Conservation Biology. 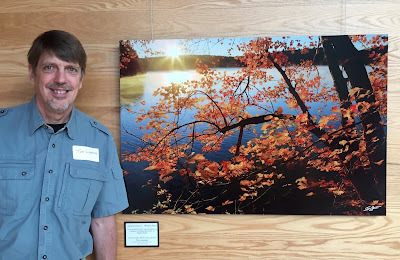 Tim Laman, a National Geographic photographer who has helped with many projects, had an exhibit of his Concord photos at the new visitors center at Walden Pond State Park. Good luck for these well-deserved accomplishments! It’s a hot May day in upstate New York, hitting 80 degrees already by late morning. I’m walking around a wide-open grasslands area with a group of people as Ralph Tabor, local Fish and Wildlife Service volunteer extraordinaire, points out the bobolinks swooping above the grass and the dying ash trees. I’ve organized a hike at Shawangunk Grasslands National Wildlife Refuge, which is a mouthful. The event is an opportunity for people to get to know their local public lands and connect with other wildlife enthusiasts. This is part of what I do working for Defenders of Wildlife. The other part takes place in a different kind of wilderness. A month ago, I was in Washington D.C., guiding a small group of New Yorkers between meetings. Shoes clicked down long marble hallways. We ducked in and out of offices, sometimes even standing in hallways to meet with a staffer and argue our case. Our nation’s bedrock wildlife protection laws – including the Endangered Species Act and Migratory Bird Treaty Act – are under attack. People from the Adirondacks down to Staten Island traveled to D.C. to remind their representatives why wildlife is important. Shawangunk Grasslands reminds us of why this work is important. It’s one of two grasslands sites remaining in the Hudson Valley in New York. Birders drive from all over the region to catch sight of a particular migratory grasslands bird as it stops through this haven of suitable habitat. We can’t let these areas slip away. And it takes active work to ensure that our wildlife protection laws and public lands will still be around for future generations. This spring, my partner Sam Roberts and I are surveying birds for the National Park Service out west. 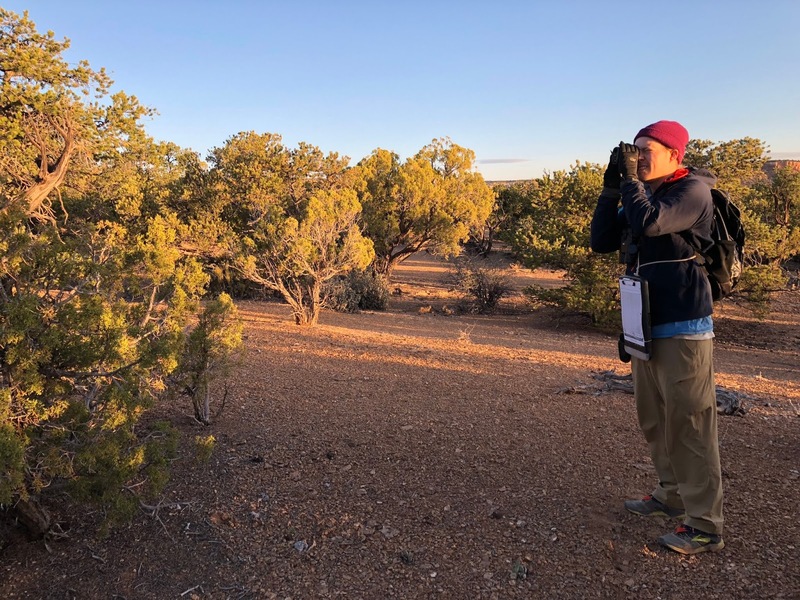 Between early-May and early-July we will have surveyed twelve parks across the Northern Colorado Plateau Network (NCPN), which is a region of parks located primarily in Utah and Colorado. Launched in 2005, the goal of these annual bird surveys is to determine what bird species are using the parks in this region, how species densities are changing over time, and what is driving those changes. To determine which birds are present and in what densities, we use a point count method. Every day before sunrise, Sam and I each navigate to a transect located in one of three target habitats: riparian, pinyon-juniper, or sage. At each of fifteen points along the transect, we then look and listen for any and all birds for five minutes, recording the species of each bird and the distance it is from us. For the most part, we detect small songbirds that are breeding in the area. Sampling with point counts allows us to estimate changes in the densities of birds over the past thirteen years of the project. 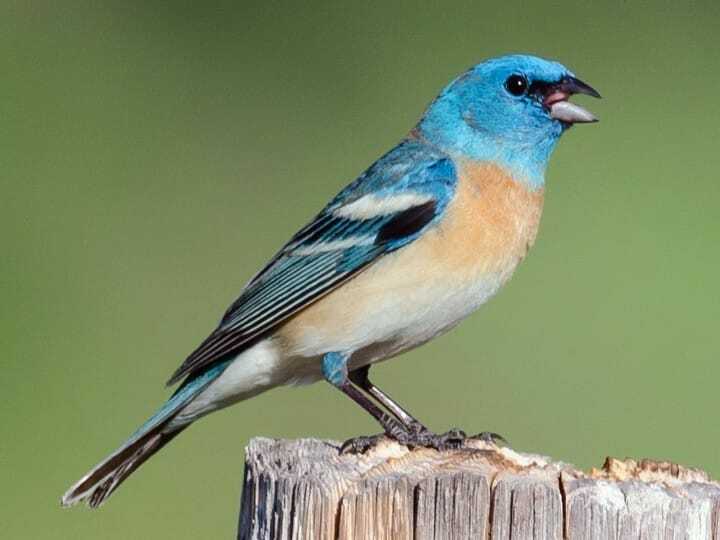 Birds with densities that have declined significantly over that time include Black-throated Gray Warblers (primarily associated with pinyon-juniper habitat), Lazuli Buntings (riparian habitat), and Sage Sparrows (sage habitat). 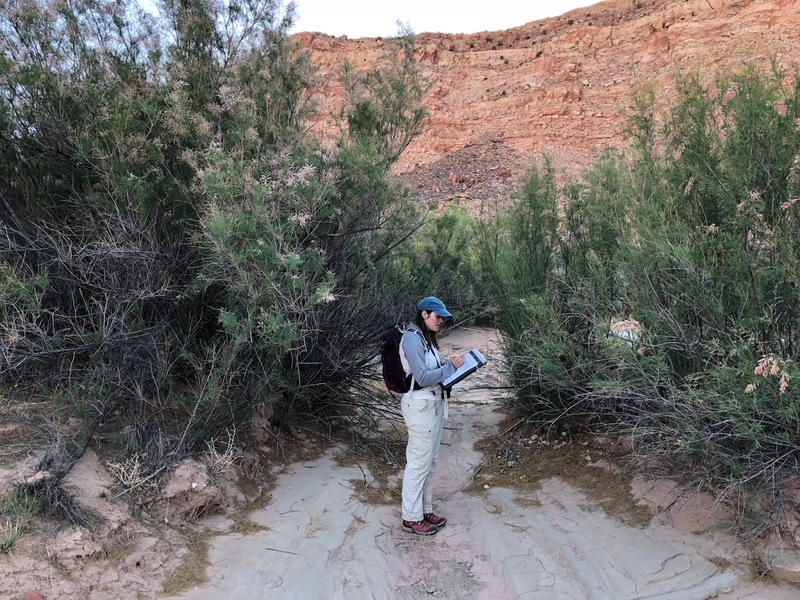 We also conduct habitat/vegetation surveys at each point, recording information like the height, abundance, and plant species present in the canopy, shrub, and ground cover, as well as the presence of snags, tamarisk, bare rocks/cliffs, and prairie dog towns. One next step for this project, in addition to continuing long-term monitoring, is to identify the drivers of changing bird densities. Possible predictors include the habitat/vegetation characteristics we have been recording, as well as remotely sensed information like precipitation patterns. You can find more information on this project, run by the NCPN and the Shriver Lab at the University of Delaware, here. Read last year’s annual report here.